Friday 11 October marked the third International Day of the Girl. The team behind the Southbank Centre’s WOW (Women of the World) Festival celebrated the occasion by hosting an early morning speed-mentoring session on the nearby London Eye, connecting mentors from a range of professional backgrounds with school-aged mentees. The first WOW Festival was in 2011 and it’s happened each year since then, celebrating the achievements of girls and women over a long weekend of talks, debates, discussions and ideas-sharing to coincide with International Women’s Day in March. I got involved in the event after I attended a planning meeting (‘think-in’!) and talk by ridiculously inspiring SC Artistic Director Jude Kelly for next year’s WOW Festival. A few weeks after the meeting I was emailed with a speed-mentoring invitation to which I immediately replied YES. The WOW event was just three informal fifteen minute one-on-one chats with a student, but even brief, one-off sessions such as this can help to demystify the world of work and perhaps open up opportunities as well as hopefully reassure and inspire mentees. In the pod I was assigned to, we six lady mentors were joined by a teacher with six year seven girls from a local school linked to the Southbank’s WOW education programme. There was a composer, a mathematician, a fashion blogger, a corporate events organiser and the head of music at an adult education college in my group and some celebrity excitement was added to proceedings by the attendance of mentors Jenny Éclair, Ruby Wax, Emmy the Great and Jessie Ware. 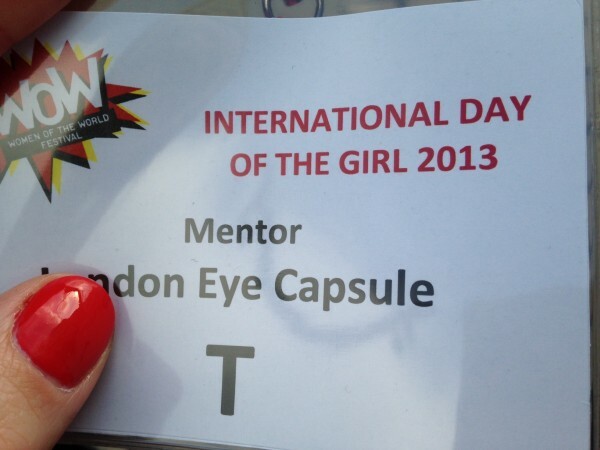 As an evening person, I was daunted by the early start (mentors had to sign in by 7.30am!) alongside thinking I must try to not bore/seem uncool/and be helpful to our teenage mentees. I am so glad that I did it though. It was so much fun to be involved in a WOW ‘off-schedule’ event with almost two hundred other women, hearing about real working lives and most importantly of all to listen to London teens talking about their education and career hopes and dreams. WOW also run speed-mentoring sessions at their annual festival and if you’d like to get involved (and I’d definitely recommend it!) between 7-9 March 2014, you can find more information about the festival here and here. Tickets to next year’s festival 2014 are already on sale.